Jaleco introduces us to their new baseball franchise with Bases Loaded on the NES. Luckily for us, it's a success as the game is actually quite good and you'll really like it if you are a fan of the sport. The basic gameplay follows the same rules as baseball and the controls are quite easy to learn. There's two cameras on the game, one close to the pitcher while batting or pitching, and a field view that's used for the rest of the game (field play) . Thanks to the use of these two cameras, the game really nice gameplay mechanics for both sides. While pitching, you can control the speed of your throw but also control the direction and position in which you want to throw it. This lets you have a good variety of throws. This is all done with the A button, while the B button lets you go back to field view in case someone in any base is trying to sneak. Similarly, the batter actually can select between several positions to aim the bat at and you have a regular swing with the A button or a gentle hit with the B button. Still, aiming with the bat can be a bit tough. Then there are also several confusing button combinations for the player at the bat, though. As I pointed out before, you can sneak to the next base any of your current players on the field. To do this, though, you'll have to do a combination of the Control Pad + the B or A button. Each direction specifies different things, like the person on 1st, 2nd, or everyone in a base has to move either forward or backwards, depending on the button pressed. While it is confusing, it still works and gives you a lot of control in the game. While fielding, the Control Pad lets you control your player that is nearest to the ball, or if you leave it still the game actually moves it automatically for you, which is a nice help. Either A or B will get your player to throw the ball, either to the player you specify direction with the Control Pad or to the home base if nothing is pressed. In the meantime, the batter will run automatically to the next base and players on bases will move if needed, but if the batting player wants, he can still use controls I previously mentioned to move his team to the next bases. Something worth mentioning about the game too is that each player actually has their own unique stats which you can see when you select your team, before the game starts. And these stats do affect the way he plays, either at pitching or at the bat. There's also a hidden stamina meter, specially for pitchers. After a certain amount of throws, you'll actually notice your pitcher will start throwing easier and slower balls. At this point is when switching player, another feature included, becomes useful. This can be done at any point before the pitcher throws the ball by simply pressing Start and then the A button and it's available for both pitchers and batters. Additionally, a forced switch can also happen if the pitcher provokes the batter by hitting him, which can start a fight, a small but interesting feature of the game. The game has really simple but ok graphics. 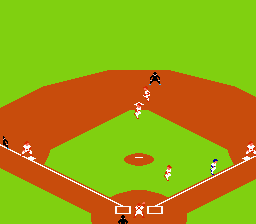 For the fielding part, you'll recognize the style of the graphics being very similar to the ones of Nintendo's Baseball game, but with more animations. 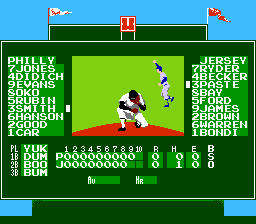 On the pitching / batting, the game's graphics become more detailed and look good for the NES. Both styles don't clash and work well overall. Between each inning or when other special situations happen, the scoreboard is shown, which looks a bit plain but does the job. On the sound part, the game is ok too. Some nice tunes that match the style of the game and the events happening. The impressive part is the sound effects, as the game actually features small voice acting during specific situations, such as whenever there's an out, ball, or strike, or also when you switch pitcher. The game features two game modes, one called Pennant and the other called VS, which are single-player and two-player mode respectively. On the first one, your objective is to beat every other team, one by one. Thankfully, the game also includes a password feature to let you resume your playthrough. The big problem with this mode, though, is the incredible accuracy of the computer at the bat. It is hard to fool them to get a strike and when they hit the ball, it's usually a good hit, or even a home run while on the other hand you'll have a hard time hitting the balls they throw. Everything of this changes on multiplayer, though, since both sides are players and things get leveled and more fun. Multiplayer, as the mode's name suggest, is just a simple exhibition match between two teams of the players' choice. 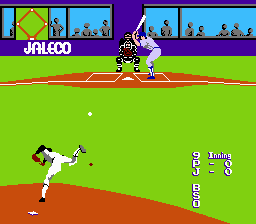 Overall, Jaleco has done a good job with Bases Loaded. The game is fun, specially in two player mode. Baseball fans should definitely check it out. All original content Copyright © 2002 - 2019 N Masters. This site is not affiliated with Nintendo.